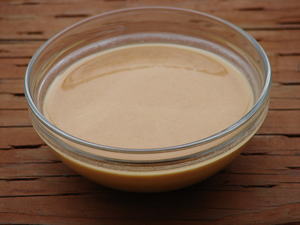 A roux is a classic thickening agent for soups, gumbo and gravy. 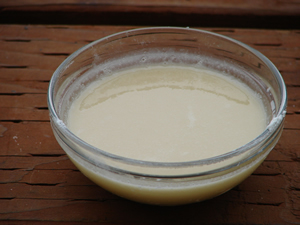 It is made by combining flour and fat over heat while whisking. Note: if you use butter make sure the heat does not get too high. This roux is the easiest to make. Simply add the oil (or butter) to a sauce pan over medium heat. Give it a few minutes to heat up and then sprinkle the flour over the oil. Whisk vigorously to make sure there are no lumps. In a few minutes you will have cooked out all the flour taste. At this point you can pour it into a soup or gumbo. This roux utilizes exactly the same process as above. 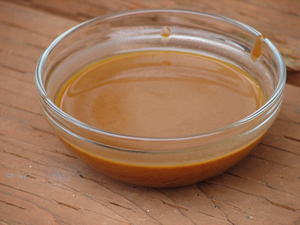 You simply keep the roux on the stove top longer, giving the roux a deeper flavor. A dark reddish roux can be formed by continuing to slowly heat the mixture on the stove top. One thing you will notice as you continue to heat the roux is that as it becomes darker, it becomes more liquidy and less like a paste. At this point do not become tempted to add more flour. The darker any roux, the less thickening power it has. But the darker the more flavor. If you want to really thicken a soup or stew with a brick roux make sure you triple the amount you make.